retreat | Build Your Walls! Guard Your Gates! Thermopylae is a narrow pass (about 50 feet wide) in ancient Greece, between Mount Oeta and the Malian Gulf. It leads from Thessaly (Thessalia) into Locris. In ancient times, it was the main route by which an invading army could penetrate from the north into southern Greece. It is best known for being the site where King Leonidas I died with his 1400 men (of whom 300 were Spartans) during the Persian Wars as they attempted to stop Xerxes and the Persian invasion of Greece in 480 BC. When Xerxes arrived with his enormous contingent of soldiers (Herodotus estimated it at 2.6 million, but it probably wasn’t nearly that high), he expected the small group of Greeks to retreat in light of his superior numbers, but Leonidas and his men refused to move. In fact, they appeared confident, even calm, in the face of certain death. Xerxes tried to wait them out for four days, but they wouldn’t leave. 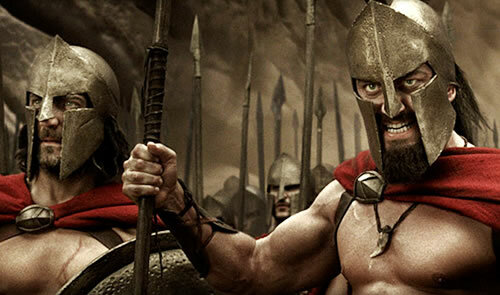 When fighting finally began, it took three days for Xerxes to defeat the Spartans. The Greeks easily repelled the initial attacks on their position, for what they lacked in numbers, they made up in determination and strategy. The Spartans believed in a code of courage and discipline. Retreat and surrender were not options. They made their stand at Thermopylae, because the narrow pass nullified the threat of Xerxes’ overwhelming numbers. Further, Leonidas knew that the Persians’ shorter spears made them unable to engage the Greeks at close quarters. Had it not been for betrayal by a fellow Greek, Leonidas and his men might have held off the Persians indefinitely, but Ephialtes, a Thessalonian, showed the Persians how to use a path over the mountain to attack the Greeks from behind. Once betrayed, it was all but over for the Greeks. Leonidas was killed as he helped defend the pass. Xerxes then dispatched his 10,000 Immortals, an elite fighting group. The remaining Greeks retreated to a small hillock, where they formed a circle around the body of Leonidas. Xerxes asked for the body of Leonidas in return for sparing the lives of the remaining Spartans, but the brave warriors refused. Xerxes didn’t want to command his men to close in on the Spartans, because it was clear that the Persian armies were afraid of the Spartans. They had never seen such determination and reckless abandon. The Spartans didn’t care about preserving their lives. They only wished to die honorably and protect the body of their leader. Faced with his soldiers’ reluctance to fight, Xerxes ordered his archers to shoot arrows into the dense circle of Spartans until the sky was blackened and every Spartan dead. Why did Leonidas and the Spartans fight so hard even after the battle was clearly lost? Leonidas took counsel of an oracle before the battle, who foretold that either Sparta would perish or one of her kings would perish. By his death, Leonidas hoped to sacrifice himself to save his city. And as it turns out, he did. While the Persians went on to take Athens, they had been delayed long enough at Thermopylae to allow the Greeks to regroup and reinforce. Later in 480 BC, the Greek navy defeated the Persians at the Battle of Salamis, halting Xerxes’ advance on Greece and putting an end to his imperial ambitions. Had the Greeks not be able to repel the Persians, the later contributions of Socrates, Plato, Aristotle and other Greeks would never have been possible. The Spartans had cohesion. They stuck together no matter what the threat. They didn’t do it because it was their job as soldiers. They didn’t do it because of the paycheck. They didn’t even do it just for their love and respect they had for their leader. They did it, because they had a common purpose that was larger than all of them. They had a unifying vision and a common enemy to that vision. If you want the commitment of your team members, you’ve got to give them something worthy to fight for….a common purpose, a common enemy, something larger than the fading motivation of a paycheck.